Today we’re going to be taking a departure from the recent slew of clothes related projects here at Craftcorners and get back to our roots with a classic paper idea. This blog post is going to be all about how you can make your very own puzzle from scratch. This is a very fun project for kids and adults alike, but children will especially appreciate it because unlike with other endeavors, they can be involved in every step of the process. There’s nothing quite like taking an idea and making it into a real and physical item completely from scratch – so what are you waiting for? Let’s get to it! The idea behind this project, as mentioned previously, is to make a puzzle completely from scratch. That means we’ll have to start by actually creating a picture! 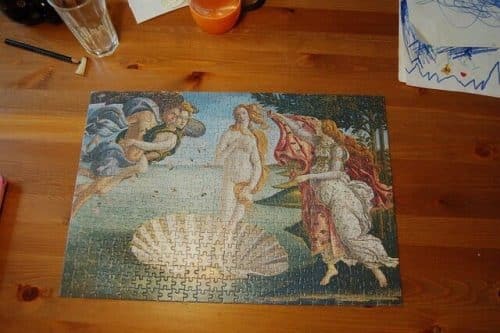 Have at it and remember to encourage creativity, but keep in mind that the more abstract the picture is, the more difficult it will be to put the puzzle back together. Coat the picture with several layers of hairspray, allowing for drying in between. This will protect it from wear. Once you’ve got your design, cut it up! Place the cut up pieces atop your cardboard or tough paper and glue them on, cutting them out again after they’ve dried. Now you’ve got a nice durable puzzle to play with!